For other uses, see Mansi (disambiguation). The Mansi (Mansi: Мāньси / Мāньси мāхум, Māńsi / Māńsi māhum, IPA: [ˈmaːnʲsʲi, ˈmaːnʲsʲi ˈmaːxʊm]) are an Ugric indigenous people living in Khanty–Mansia, an autonomous okrug within Tyumen Oblast in Russia. In Khanty–Mansia, the Khanty and Mansi languages have co-official status with Russian. The Mansi language is one of the postulated Ugric languages of the Uralic family. The Mansi people were formerly known as the Voguls. Together with the Khanty people, the Mansi are politically represented by the Association to Save Yugra, an organisation founded during Perestroika of the late 1980s. This organisation was among the first regional indigenous associations in Russia. According to the 2010 census, there were 12,269 Mansi in Russia. 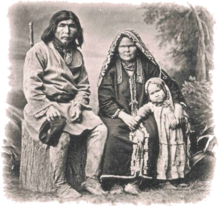 The ancestors of Mansi people populated the areas west of the Urals. Mansi findings have been unearthed in the vicinity of Perm. In the first millennium BC, they migrated to Western Siberia where they assimilated with the native inhabitants. According to others they are originated from the south Ural steppe and moved into their current location about 500 AD. The Mansi have been in contact with the Russian state at least since the 16th century when most of western Siberia was brought under Russian control by Yermak Timofeyevich. Due to their higher exposure to Russian and Soviet control, they are generally more assimilated than their northern neighbours, the Khanty. The Mansi are said in legends to have ridden moose (Eurasian Elk) into battle, though there is no historical evidence of this. Sergey Ustiugov - Russian cross-country skier. Wikimedia Commons has media related to Mansi. ^ Официальный сайт Всероссийской переписи населения 2010 года. Информационные материалы об окончательных итогах Всероссийской переписи населения 2010 года [Official site of the National Population Census 2010. Informational materials about the final outcome Russian Census 2010] (in Russian). RU: GKS. ^ "National composition of population". Census (in Ukrainian). UA: State statistics committee of Ukraine. 2001. ^ a b c "The Mansis". The Peoples of the Red Book. EE: EKI. ^ "Khanty & Mansi". Encyclopædia Britannica. ^ "Finnish media fall for 'Soviet battle moose' hoax, probed by regulator". RT International. 25 November 2017. Retrieved 17 September 2018.